GRP Planters can be used for interior and exterior projects. It is strong, watertight and light weight. Ideal for roof gardens where access is difficult and weight saving essential. It won't be damaged by frost and readily accepts different paint finishes including metallics. Glass Fibre is not recyclable but will last for over 20 years! So because it does not need replacing for such a long time it is very eco friendly. Conical Planters can be used in or around the home, are light weight and frost proof. Available in a variety of colours including metallic finishes. 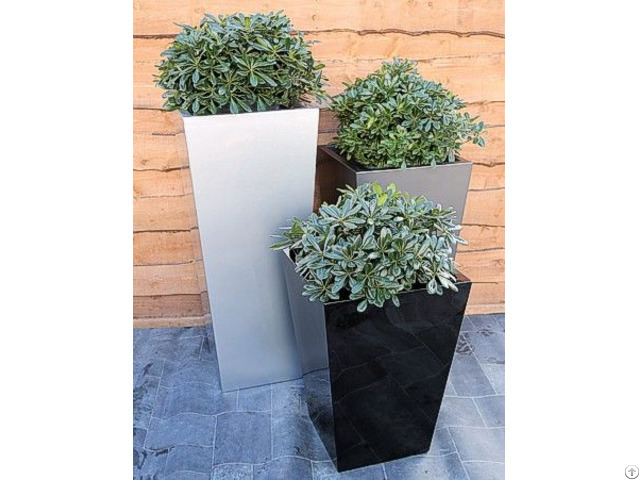 These planters are frost proof, fully watertight and will last inside or out for many years. Good to use in Outdoor and indoor decoration for living room, hotel, holiday resort, garden, balcony, etc.